INTROIT Behold, O God, our protector, and look on the face of thy Christ:, for better is one day, in thy courts above thousands. How lovely are thy taber­nacles, O Lord of hosts! My soul longeth and fainteth for the courts of the Lord. (Ps. LXXXIII.) Glory etc. COLLECT Keep, We beseech Thee, O Lord, Thy Church with Thy perpetual favor; and because without Thee the weakness of man is ready to fall, may it be withheld by Thy aid from all. things hurtful, and devoted to all things profitable to salvation. Thro'. EPISTLE (Gal. V. 16-24.) Brethren, Walk in the spirit, and you shall not fulfil the lusts of the flesh: for the flesh lusteth against ,the spirit, and the spirit against the flesh: for these are contrary one to another: so that you do not the things that you would. But if you are led by the spirit, you are not under the law.. Now the works of the flesh are manifest, which are, fornication, uncleanness, immodesty, luxury, idolatry, witchcrafts, enmities, contentions, emulations, wraths, quarrels, dissensions, sects, envies, murders, drunken­ness, revellings, and such like: of the which I foretell to you, as I have foretold to you, that they who do such things shall not obtain the kingdom of God. But the fruit of the Spirit is charity, joy, peace, patience, benignity, goodness, longanimity, mild­ness, faith, modesty, continency, chastity. Against such there is no law. And they that are Christ's have crucified their flesh with the vices and concupiscences. What is it to walk in the spirit? It is to obey the inspirations of the Holy Ghost always, and in all things. He who does this, says St. Paul, will not do the evil works of the flesh, which are here enumerated, but he will rather suppress and mortify all sensual desires, in this manner crucify his flesh together with its vices and lusts, and make himself worthy of the fruits of the Holy Ghost, which are also mentioned; he will belong to Christ, and secure for himself eternal happiness. On the contrary, he who lives according to the flesh, that is, gives way to the desires of the flesh, has no hope of salvation. GOSPEL (Matt. VI. 24-33.) At that time, Jesus said to his disciples: No man can serve two masters; for either he will hate the one and love the other, or he will sustain the one and despise the other. You cannot serve God and Mammon. Therefore I say to you, be not solicitous for your life, what you shall eat, nor for your body, what you shall put on. Is not the life more than the meat, and the body more than the raiment? Behold the birds of the air; for they neither sow, nor do they reap, nor gather into barns, and your heavenly Father feedeth them. Are not you of much more value than they? And which of you, by taking thought, can add to his stature one cubit? And for raiment, why are you solicitous? Consider the lilies of the field, how they grow; they labor not, neither do they spin; but I say to you, that not even Solomon in all his glory was arrayed as one of these. Now, if God so clothe the grass of the field, which is to-day, and to morrow is cast into the oven, how much more you, O ye of little faith? Be not solicitous, therefore, saying: What shall we eat, or what shall we drink, or wherewith shall we be clothed? For after all these things do the heathens seek. For your Father knoweth that .you have need of all these things. Seek ye therefore first the kingdom of God and his justice; and all these things shall be added unto you. What is meant by serving God? Doing the will of God, or performing faithfully and zealously all that God asks of us according to our age and condition, and for love of Him. Who are the two masters whom we cannot serve alike? God and Mammon or riches, whereby also, the other goods and pleasures of the world are understood. These we cannot serve at the same time, because they command things diametrically opposed to each other; for instance, God prohibits usury, theft, deceit, &c.; to which the desire for wealth impels us. God commands that we keep holy Sundays and holy days, and devote them to His service; the desire for riches tempts man to omit religious worship and to seek temporal gain; it disturbs him even in church, so that he is only present with his body, but absent in mind with his temporal goods and business. To whom can riches be useful? To those who, like the saints, perform works of mercy with them, and thus lay up treasures for themselves in heaven. Why does Christ call our attention to the birds of the air and the lakes of the field? To, excite in us confidence in the providence of God, which preserves even the birds and the flowers. Surely, if God feeds the young ravens which cry to Him; (Ps. CXLVI. 9.) if He nourishes the birds which neither sow, nor reap, nor gather into barns; if He vests the flowers of the field so beautifully, how much more will He care for man whom He has made to His own image and likeness, and adopted as His child, if he only acts as such, keeps His commandments, and always entertains a filial confidence in Him. Should we, therefore, lay aside all care and never work? What should preserve us from superfluous cares? A firm and lively faith, that God can and will help us. That He can is evident, because He is almighty; that His will is certain, because He promises it in so many pas­sages of Holy Writ, and because He is infinitely faithful to all His promises. Christ encourages us to this lively confidence with these, words: All things whatsoever you ask when ye pray, believe that you shall receive and they shall come unto you. Mark XI. 24.) Therefore the apostle also commands us to throw all cares upon the Lord, who provides for us. (I Pet. V. 7.) And why should God not care for us, since He sent us His Son and with Him all; for which reason St. Augustine says: "How can you doubt that God will give you good things, since He vouchsafed to assume evil for you!" PRAYER O Lord Jesus! give me a firm confidence in Thy Divine Providence, and daily increase it in me, that when in necessity I may confidently believe if I seek first the kingdom of God and His justice, the rest shall be added unto me. In your distress say with job: The Lord gave and the Lord bath taken away: as it pleased the Lord, so it is done: blessed be the name of the Lord. Naked came I out of my mother's womb, and naked shall I return thither. (Job. I. 21.) Fear not my son, says Tobias, we lead indeed a poor life, but we shall have many good things if we fear God, and depart from all sins, and do that which is good. (Tob. IV. 23.) To serve God and to be content with few things always brings rich reward, if not in this, at least in the next life. 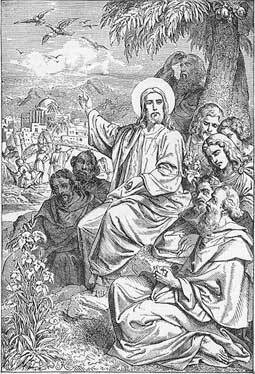 Therefore Christ promised the kingdom of heaven to the poor in spirit, that is, not only to the humble, busy also to the poor who imitate Christ in all patience and resignation. Follow, therefore, the poor Jesus, follow His poor mother, by imitating their example, and you will possess the kingdom of heaven.